CRUISE MARKET WATCH 1,800-vehicle parking garage and surrounding areas was set at a cost of $150 million. Carnival agreed to contribute up to $50 “Cruising the Caribbean is million as part of a 25-year operating agreement with the line that began Sept. 1, 2018. Grand Cayman, Haiti, Honduras port offcials. Murray said Carnival would pay the $50 million and the Dominican Republic have to Port Canaveral through a special fee, called a “capital cost recovery charge.” The port will charge Carnival for every pas- built or are planning new docking senger getting on or off a Carnival ship at Port Canaveral until facilities. Antigua and Barbados the $50 million total is reached. Murray said the fee is likely to be about $2.74 per passenger are among those expanding their boarding or departing a Carnival ship at the port. The port will ports to accommodate still-larger assess Carnival the fee, but it is not likely to actually show up on passenger ticket charges. Notably, a LNG bunker barge cruise ships. Following a recent port sailing from Georgia will fuel the Mardi Gras. When complete, the 1,130-foot-long, 180,000-ton vessel will overshadow the lines’ largest ships, Carnival Vista and Horizon, almost 1 million cruise visitors for which are 133,500 gross tons. Maximum passenger capacity is the upcoming season.” around 6,500. It is the second of 11 next-generation cruise ships expected from Carnival Corporation between 2018 and 2025 that will generate their power at sea and in port from LNG. 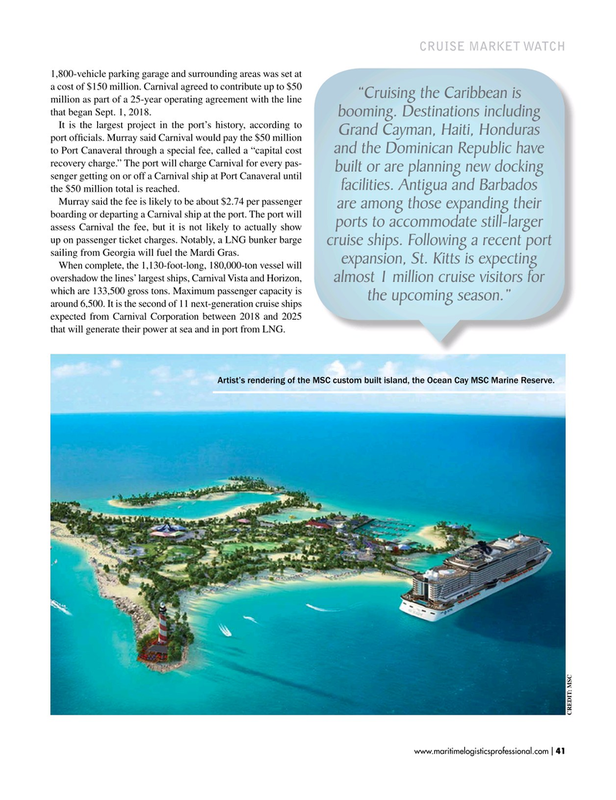 Artist’s rendering of the MSC custom built island, the Ocean Cay MSC Marine Reserve.